I’ve noticed a trend in the last year. More and more news stories are covering incidents where gun owners (usually with concealed carry licenses) use their firearms inappropriately or even recklessly. Along with this trend I’m also seeing more gun owners cheering them on, usually from a “get tough on criminals” point of view. As it happens, more of these people being convicted for their actions. Take, for instance, this case from Minnesota (which I think I shared in a Hump Day Reading List when it happened). Three teenagers were peering into a house, apparently to case it for a burglary, when the owner spotted them. The “yoots” (thank you, Joe Pesci) ran for their vehicle, one of them breaking his ankle in the process, and proceeded to drive away. In the meantime the homeowner retrieved his pistol and ran after the car, shooting rounds he claimed were intended to flatten the front tires. Instead his bullets hit the driver, who died on the scene. 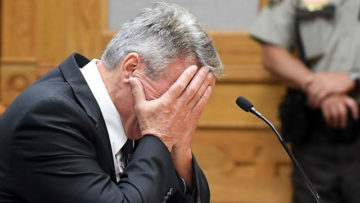 The homeowner recently plead guilty to a felony, which makes him a prohibited person for the purposes of owning a firearm. That’s him, above. Another recent case in Washington State had a homeowner running after and emptying his pistol at his departing Jeep, which had just been stolen. One of his bullets ended up killing a neighbor who was asleep in her bedroom, and he is now awaiting sentencing after pleading guilty to manslaughter. There’s a lot to learn from these incidents, but the one I want to focus on is the danger of righteous indignation. Let me be very clear: I don’t like criminals. I don’t make excuses for them, and I believe they should be punished when caught. Car prowlers, sneak thieves, burglars, and their assorted ilk are detestable in every way. I completely understand the anger and frustration one feels as the victim of their crimes. That being said, being mad isn’t justification for employing lethal force. As I watch cases around the country, I’m seeing more prosecutors bringing charges against people whose use of the gun is based on infuriation, rather than objective and articulable fear of harm. As I said, I completely understand the anger. But you can’t let blind rage control your actions when you’re dealing with something as final as lethal force. Shooting and killing a petty thief who posed no real threat is likely to have far-reaching consequences for all areas of your life. Inadvertently killing a neighbor, or worse yet a loved one, will likely destroy your life. Is that risk worth indulging your indignation? The courts are also starting to look askance at those whose actions with a gun escalate an otherwise petty incident. For instance, if you chase a thief out of your home and pursue him off your property, the court might see two separate incidents: the first, where you stopped a burglary in progress, and the second where you chased someone who was simply trying to get away from you. There have been otherwise law-abiding people prosecuted because they couldn’t understand their behavior was seen as a separate assault, the original incident — the theft — having ended when the suspect left the premises. This tendency toward pursuit seems to be very common. There appears to be a strong desire, mostly driven by anger, to chase down a suspect and…well, do something. We see movies and television shows where the good guy chases down the bad guy to extract payback over being disrespected; the bad guy gets what’s coming to him, and the good guy’s dignity is restored! It doesn’t really work like that, as the gentlemen in both cases found out the hard way. Beyond the legalities, there is an important safety dynamic in this chase fantasy that should be mentioned. When you drive someone from your home with the threat of force represented by your firearm, it’s just an occupational hazard for the bad guy. He knows that sooner or later he’ll come across a mad homeowner with a gun, and his rapid flight is the mechanism he’s chosen to eliminate the threat to his well-being. Crooks usually want nothing to do with an armed resident and simply want to get away. Once he’s made his escape, the dynamic changes rapidly. The pursuer, who was initially the good guy, now represents capture to the criminal — in the same way the police represent capture. The crook who might run even when confronted by an unarmed homeowner often turns quite vicious when he believes capture is imminent. This very dynamic has played out in several recent incidents I’ve studied, and it’s the homeowner — not accustomed to the violence of the criminal subculture — who often loses the fight he didn’t see coming. That’s a high price to pay just to indulge your anger. Is a television really worth shooting someone? If you’re getting the impression that chasing bad guys is generally a bad idea, and shooting at them absent an immediate lethal threat an even worse idea, you’re right. Understand that when you’ve stopped a property crime, and the suspect is leaving or attempting to leave and posing no immediate and articulable threat, your use of lethal force is likely to be inappropriate and therefore punishable. Of course there are many variables which affect the justification of shooting, but none of them should involve anger. Yes, I know you worked hard for that car or that big screen TV. I understand you’re mad someone would just take it from you. But while “threatened” may be a valid reason to use your firearm, “infuriated” rarely is. P.S. : As always, I am not a lawyer and this is not legal advice. I strongly urge you to contact an attorney, or take a course in self defense law, to learn the many nuances of the use of lethal force. Photo by Pat Christman, The Free Press, from the linked article. Hey Buddy!, I found this information for you: "There’s a difference between “infuriated” and “threatened”". Here is the website link: http://www.grantcunningham.com/2017/07/theres-difference-infuriated-threatened/. Thank you.